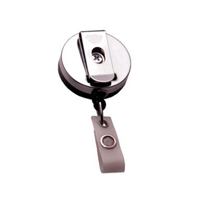 Retractable Badge Reels are the stylish way to wear your IDs. Ideal for active cards – just pull towards the card reader and the cord then retracts into the reel. They come in an different shapes and sizes, solid black, with a chrome trim or translucent cover which enables the workings of the reel to be seen. With cord lengths un to 76cm, they have a convenient reach are very durable for long-term use. Ideal for all Access Contol cards. Ideal for cards that need to be swiped continually or for proximity cards. 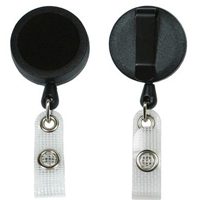 Easy ID Retractable Badge Reels are the stylish way to wear your IDs. Ideal for active cards – just pull towards the card reader and the cord then retracts into the reel. They come in an attractive oval shape with a chrome trim and its translucent cover enables the workings of the reel to be seen. 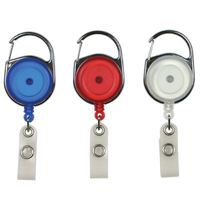 The carabiner-style badge reels are available in 3 translucent colours (clear, blue & red ) and are quick and easy to secure. With a cord length of 76cm, they have a convenient reach and are very durable for long-term use. 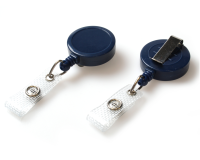 Heavy Duty Retractable Badge Reels – Ideal for active cards – just pull towards the card reader and the cord then retracts into the reel. They come in metal finish only. With a cord length of 76cm, they have a convenient reach and are very durable for long-term use. Reel diameter 1.5″ (38mm) Item no. CM329-4415. Reel diameter 2.0″ (51mm) Item no. CM329-4416.